The set "kids" is made of NEW NYLGUT, produced in Italy on Aquila's own extruding machines. Thanks to a proper balance of string gauges, these strings fit Soprano, Concert and Tenor ukuleles. 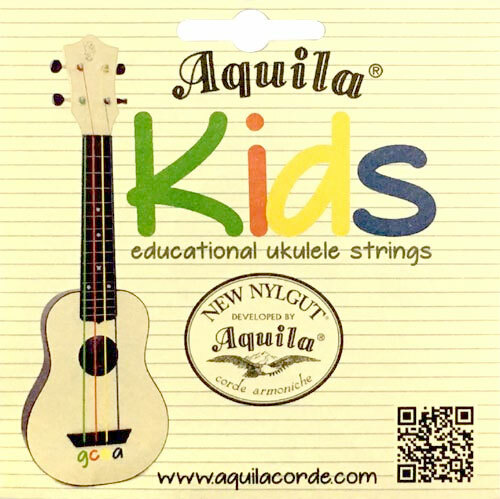 The set also contains a sticker and a mini guide to playing the ukulele. These play just like other nylgut strings I've used but the tension caused the top to sink and the neck to bow on the plastic uke I put these on. Not sure if they are meant to be tougher than normal for student players but it was a surprise when it made the instrument unplayable. Rather than saying, "put your index finger on the 1st string; remember, that's the one that's closest to the ground when you're holding your uke like you're strumming it", now I just say, "put your index finger on the blue string." They love that. Q: Can I use linear tuning with these strings (low G)? This set is designed for High G tuning.